Is geography destiny in health care? Variation in care challenges both health policies and the medical professions—if variation cannot be avoided, can it be used to better understand and improve our health care systems? Using knowledge derived from the Dartmouth Atlas of Health Care and colleagues from around the world, more than 160 policymakers, physicians, and researchers gathered to grapple with these questions and to share ideas about the value of measuring health care at a local level during the Wennberg International Collaborative’s (WIC) first open international policy conference held last month in Berlin, Germany. 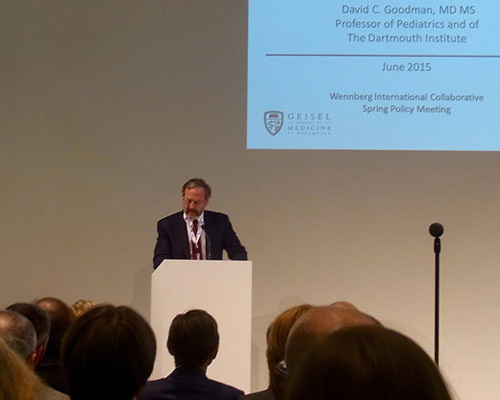 Dr. David Goodman speaks at the Wennberg International Collaborative’s first open international policy conference held last month in Berlin, Germany. “The meeting was a significant milestone in the international development of ideas, methods, and findings originating from the research of John Wennberg and colleagues at the Dartmouth Institute for Health Policy & Clinical Practice (TDI), ” says David Goodman, MD, MS, co-founder and director of the WIC. 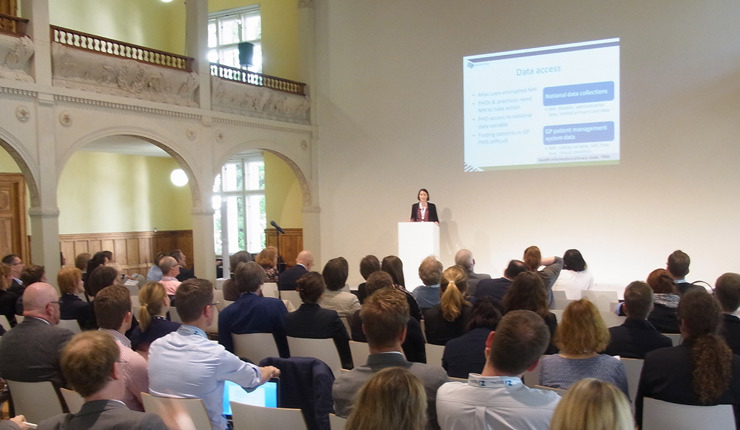 The conference was organized and hosted by Zi, Central Research Institute of Ambulatory Health Care in the Federal Republic of Germany. Canada and the United Kingdom were early collaborators and adopters of the Dartmouth Atlas’ methods of studying unwarranted variation in health care, but the methods have received little attention in other developed countries. The purpose of this conference, and future conferences, Goodman says, is to create a learning environment for countries interested in measuring health care variation and to use the information to improving day-to-day health care, as well as health policy. At the WIC meeting, researchers and policy makers can share their questions and expertise to accelerate the development of health care atlases, research studies, and improvement strategies. “Some health policy thinkers in the U.S. idealize the health care systems of other countries over our own,” Goodman says. “It’s true that other developed countries have universal insurance and a more organized approach to planning health care, but they are confronted with the same problems of uneven quality and rising costs. Measuring health care at the local and regional level can help every country understand where health care value is high, and how it can be improved. While comparing health care systems among countries may be interesting, it doesn’t help a country improve its health care at the level of communities and local health care systems, Goodman notes. That can only be accomplished by measuring regions and health systems within a country. WIC’s distinguishing characteristic is that, “we are not focused on comparing health care from one country to the next,” he says. The focus is on practical methods, interpretations, communication of variation, and strategies for using the information within an individual country. Goodman and Julie Bynum, MD, MPH, both researchers at TDI, presented during the conference. Goodman talked about the value of addressing issues related to regional variation in health care, lessons learned from the Dartmouth Atlas, and moderated a panel discussion on “Health care atlases—Mapping a road to improvement.” Bynum discussed using claims data to create meaningful steps toward accountable care. Presenters from England and Italy also shared what they learned from mapping regional variations in care. WIC’s spring conferences typically focus on issues specific to host countries with relatively little analysis of health care variation. While topics related to measurement and research are part of the discussion, there is a broader concentration on policy and further developing the ideas of Wennberg and TDI faculty. Research meetings are by invitation only and consist of a core group of investigators. What began as an informal meeting of a relatively few researchers and policy analysts, has resulted in a research network and scholarly community that has accelerated the dissemination of the work being done at Dartmouth. WIC, which is a joint effort of TDI and the London School of Economics, is a research network dedicated to improving health care by examining organizational and regional variation in health care resources, utilization, and outcomes.